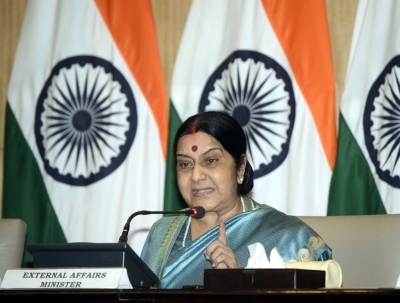 New Delhi, Oct 31 (IANS) External Affairs Minister Sushma Swaraj said on Tuesday that she had spoken to an Indian student assaulted in Italy’s Milan and was told that it was not a racial attack but robbery. Sushma Swaraj, who earlier said she was personally monitoring the situation amid reports of attacks on Indian students in Milan, tweeted about her conversation with the student concerned. “Attack on Indian students in Italy — I have spoken to the Indian student concerned in Milan. He has told me that it was a case of robbery and not a racial attack. She also appreciated the help rendered by the Consulate General of India in Milan. The Minister had earlier asked the students not to worry and said she had got a detailed report. “Attack on Indian students in Milan: I have got the detailed report. Please do not worry. I am monitoring the situation personally,” the External Affairs Minister had said in a tweet. The Indian Consulate in the Italian city issued an advisory, asking Indian students not to panic and to contact the mission in case of such incidents. The report of the attacks came as Italian Prime Minister Paolo Gentiloni was in India on a two-day visit, and held talks with Prime Minister Narendra Modi on boosting ties that have seen a marked downswing over recent years. The Indian Consulate in Milan had on Monday said that it has received reports of attacks and cautioned students to stay away from any area perceived to be of risk. “The Consulate has received reports of unfortunate incident of attacks on the Indian students in Milan. All Indian students are urged not to panic. “Students are also requested to report such matters to the Consulate on Consul General’s cell phone number 3290884057 immediately,” it said, adding it will help students concerned to take up the issue with the higher authorities in Milan so that all efforts can be made to prevent recurrence of such incidents. “In the meanwhile, students are advised to be in touch with each other (particularly when they go out) as well as with the consulate and spread the information among other students about the areas where they face such incidents so that such areas can be avoided or approached with greater caution,” the statement added. According to reports, the attacks took place on October 17 and October 30. Three Indians students were allegedly attacked with beer bottles. There is a 180,000-strong Indian community in Italy, the third largest in the European Union after Britain and the Netherlands. Gentiloni was in India for the October 29-30 visit, the first by an Italian Prime Minister in over a decade that helped thaw the bilateral ties.